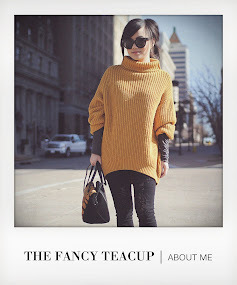 the fancy teacup: golden moments. When I was younger, I used to shy away from bold and uninhibited hues. As I've gotten out of my shell as the years have gone by, uncommon colors have now drawn me to them. I am definitely a happy wearer of unique colors now. Chartreuse happens to be one of those happiness makers. I found this goldmine of a sweater in a COS store back in London (so glad they are starting e-commerce stateside!) and it has been a go-to piece from my wardrobe. Warmer weather equals brighter colors in my opinion. I also selected this pretty little dress from my friends over at Asos. Seeing the scaled print on the fit and flare silhouette was another golden opportunity for me. I am a bit of sucker when it comes to that kind of style with a stop-and-stare kind of pattern. Gorgeous setting, and super pretty look! Feels like spring. I love the color of that cardigan! It's the perfect compliment to that clutch. That's such a cute dress! Everything about this photo is just perfect; the lighting the outfit ... perfect! LOVE the mixed prints. Great look :) you look nice! It's always such a pleasure to see a post from you pop up in my bloglovin feed, Jamie :) You are looking lovely as ever. I will always admire your ability to combine a pop or two of colour with neutrals and make it all look so natural. Just found out about your blog, it is lovely! 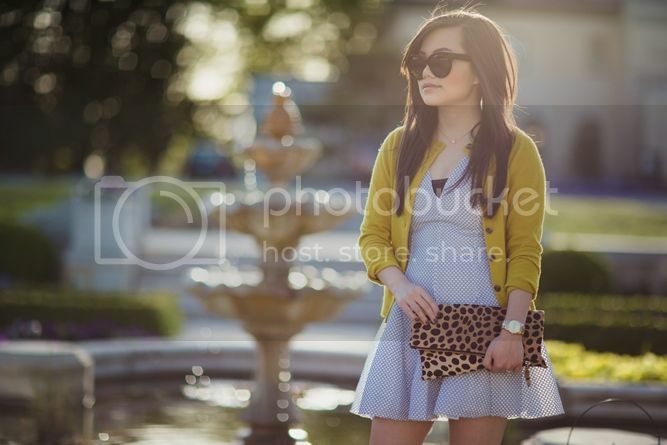 Great outfit too, I like how you combined the print clutch with this look. So prety! Love the clutch and those pretty heels! Gorgeous, I love this entire look! This outfit is so cute! The combination of that cardigan and dress is amazing! That golden yellow cardigan is GORGEOUS!!!! FABBB styling! So girly and pretty! Such a sweet look honey! I love you in these cardi/dress sets...vintage J at her finest! Killer bag! What an idillic setting for outfit photos, and I'm glad you have embraced bold colors and prints, they make getting dressed so much more fun. such a cute look. love your slouchy bag, been looking to get my hands on one like that! You look lovely! I adore this outfit on you! Perfect Outfit! Love the heels! Wow, such a lot of beautiful pics! And I really like a lot your look. Love this outfit! You look very cute! Cute outfit. Love the pop of leopard. I need to bite the bullet and buy the Clare Vivier clutch! So cute, love the mustard yellow color! Gorgeous! I love the yellow and blue color combination! You have an amazing blog, keep up the good work ! I love how there is the perfect amount of sunlight; it makes your outfit look even better and complements your cardigan so well. Gosh, this outfit just looks so great put together! Thanks for sharing. Wow, I admire your consistency with your blog for years. Stunning photos, I love the colour of your cardigan! I love the combination of your mustard cardigan and your scale print dress, it makes for a rather playful ensemble. I especially love how you shook up this look with a polka dot clutch, very 1980s Carrie Bradshaw. Amazing outfit! Such a cute dress! This outfit is so beautiful. 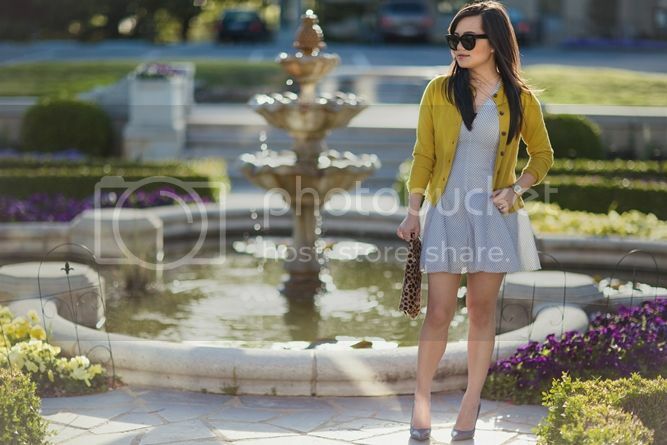 I love the yellow cardigan paired with the blue dress. Great color combination. You look amazing!Love this look!Gorgeous! I really love this look. The touch of yellow in your outfits is pretty amazing. wow so lovely dress. You looks like an angle. I like to follow your dress and style. I will buy frock kurtis & Skirts for this summer. Many Many thanks for sharing with us. Mix prints clutch look perfect for any wedding or party look. Even I think we can take it to work place.